This evening C "graduated" from preschool. Thankfully, the "graduation" was developmentally appropriate, which is why I so love this preschool. The children filed into the church, each class sang two songs, the children sang two songs all together, and they filed out again. But each and every child (well, except for the one little girl who saw her parents in the pew and decided to sit down with them instead of continuing down the aisle) thought it was the best. thing. ever. And anyone who has met C will not be at all surprised to hear that he was the talk of the post-preschool graduation festivities. C was one of the first children down the aisle, biting his lip and looking not quite happy. But as soon as he saw us and got those five year old "Hi MOM! HI! HI DAD!" waves out of the way, he stood in his spot, and was even overheard telling the boys on either side of him that "I can't chat now, we need to be quiet." Unheard of I tell you. Then, the music started. And all the entire audience heard was my son belting out the songs as loudly as he could. His (very off-key) voice was literally the only thing you could hear the entire concert. Well, that and A screaming "C! I see him! Hi C!" C was very serious and intent about the whole event, and I couldn't decide whether I should laugh or cry. So I did both. Afterwards, it took us a good half-hour to make it out of the school as each parent and teacher had to stop us and comment on C's enthusiasm for the songs. The principal even stopped me as I was about to finally exit the building and said "I told you that there was always one child who entertained us each graduation, and I am not at all surprised that it was C. But at least this year we were entertained in a good way, as he was doing EXACTLY what we kept telling them to do, 'Sing loudly!'" Happy graduation C, and may you find a calling in life that does not involve carrying a tune. I love you bud. Four words for you. Last. Day. Of School. Tomorrow. OK, that was five. Sue me. Really! Please! Because then I might have something to focus on all summer that didn't involve keeping two children who just discovered the joys of sibling bickering occupied. I can't believe I ever thought that a summer of hanging out and doing nothing was a good idea. It wasn't. It was a horrid idea. We will never survive. For example, today. We had to go to the cell phone store (cell phone+toilet=rather gross, also very dead and very expensive) and the grocery store. By the time we made it out of the cell phone store, A had lost her Dora Popsicle privileges for the foreseeable future and C had lost Radio Disney for two days. Which resulted in a group temper tantrum (which did ultimately land me a $40 discount to get us the hell out of the store as quickly as possible). I am rather sure that if the clerk hadn't forked over the discount, the business man standing in line behind me would have gotten on his (working) cell phone and called someone to take us far, far away. Then, at the grocery store, we ended up leaving because the kids could not. keep. their hands. to. themselves. Which resulted in no groceries. And, while that may be easy on the pocketbook, it will become a real issue rather quickly as I am down to my last soy milk and apple. Do you think I could stock up on a summer's worth of groceries tomorrow? How long does ultra-pasteurized milk last these days? If you see SOS signals coming from the general direction of my backyard, please send in reinforcements. Please, I beg of you. Preferable in the form of chocolate. Or a nanny. Walking out of church yesterday a woman was complaining that she hadn't been able to get her teenagers out of bed this morning, and that now with summer arriving she was going to be spending her life hounding them to get up. I blinked, and look at my two who, never fail, are up at the crack of dawn, and envied her ability to get up and read the paper in peace. I almost stopped her to ask when this miraculous event occurs, and whether she thought it would happen to my kids as well, but then I realized that by junior high and high school when first bell is at 7ish, having children who want to sleep until noon is going to be just as annoying as it is to have kids who are insisting on getting up at 5:45 every morning when you have no place to go. In fact, I suppose that I should try to keep them on this schedule until high school, because then I shouldn't have any problems getting them out the door to the bus stop on time. This is off to the side of the yard. I think I am going to turn it into an herb garden. That's not such a big project, just some weeding and whatnot. 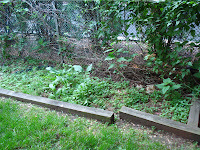 This is the overgrown and weedy bed next to the soon-to-be herb garden. It is very shady, making it more of a challenge. 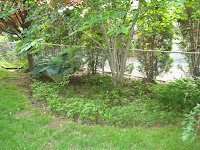 I have a feeling that most of the replacement stuff will have to get planted in the fall, but I can start ripping out the weeds and such this summer. 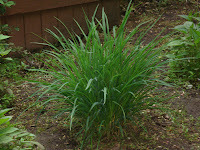 And this is in one of the beds next to the deck. Do you think it is a lily? Our other house had tons of lilies at the old house, but they were a lot bigger. But it sort of looks like one, no? I'm so clueless as to plant names. 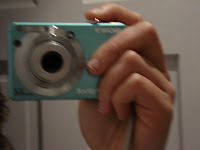 Thanks to the fantabulous Nana, I am now the proud owner of a simple point a shoot digital camera. M is quite the photo fanatic, so up to this point our primary camera(s) have been high end film and, most recently, a digital SLR that quite honestly scares me. Plus, it was so large that it was not a "grab the camera and throw it in your purse" type of thing. Taking the camera someplace involved a large bag, straps, protective lens covers, and strong warnings about what would happen to me if something happened to the camera. The end result? I only took pictures on major holidays, and even those were far and few between. Nana decided that this was not an acceptable way for her to watch her grandchildren grow up from afar and took matters into her own hands last week. Internets, meet (a slightly blury because I couldn't use the flash) Suzie. Suzie, meet the Internets. You will now be put into use recording knitting and house projects for their viewing pleasure (oh, and cute kid pics for Nana and the other grandparents). The kids have never been much for cute kidisms, but we have a few which we seem to be losing and I wanted to record them for posterity so I don't forget. Another one of C's was "O Nee Nee" for Old Navy. It was one of his first words, which should tell you how much time we spent there when he was going through a size every six weeks or so. I took the kids there for the first time in a long time the other day to try and find some non-stained tee shirts for myself, and called it "O Nee Nee." C looked confused, and when I explained to him, he looked at me and informed me that he was no longer a baby and now called it Old Navy and so should I. So sad. Rock-a Bye I found too scary (what baby wants to think about falling out of a tree I ask you? NOT condusive to a good nights sleep) so I changed the words. But Mommy will catch you, cradle in all. My changes apparently caused much confusion in preschool last year. The teachers finally stopped trying to have the kids sing it because C refused to acknowledge the correct wording. I am sure there are more that I might think of and I'll add them on, but I probably waited too long to do this post and I'll never remember them. Sigh. Today was C's last day of lunch at school, and in honor of that, I decided to give his lunch box a good thorough cleaning instead of the quick once over that I usually do. As I started scrubbing the outside, I found a pocket that I had never, ever seen before. And that pocket felt rather odd. I opened it up, and out fell a litter of papers. Flyers about family events from weeks ago. The contract for A's tuition next year that the office insisted they had sent home and I insisted that I had never seen. A note from his teacher about the end of the year party, which I am apparently coordinating next week. A birthday party invitation for a party that has long since come and gone. M is away in California for the week. Thankfully, the travel season is almost over. But in his absence I hosted his sister and her kids for dinner tonight. For some unknown reason I decided to grill even though (and I'm highly embarrassed to admit this) I have never actually operated a grill before. M loves to grill so I've always just left the outdoor cooking to him and took a welcome break from meal prep. But, it all changed tonight baby! After a frantic phone consultation with M ("How do I turn it on?!?" "How long would you cook this!?! "), I fired the grill up. And the food was good. M, watch out, I just might have to start grilling! Or, perhaps I will continue to sit in my lounger with wine glass in hand and comment on your technique. Either way, grill season is here and I am thankful. I feel like I have blogged about this before and I am about to become the really annoying person who tells the same story over and over again (OK, who am I kidding, I am that person. Really. Did I ever tell you about the time...), but I'm too lazy and tired to troll through my archives to find out for sure. So forgive me if you've read this rant before, but I spent most of dinner the other night ranting to M about it (wild hand gestures knocking over water glasses and all) and the topic is still on my mind. I feel like my children are the only ones in the world (OK, in our town at least) who do not play seventeen sports, take a foreign language, and have at least a playdate a day. I spent my hours working the book fair last week listening to the other moms complain about how they never have a moment to breathe as they chauffeur their (five-year old) children from activity to activity. "We have school from 9-11:30, I pick up McDonalds on the way to gymnastics. Right after gymnastics we head to so-and-so's for a quick playdate, then at 3:30 she goes to ballet. After ballet is soccer, and then it is home for dinner and Spanish flash cards to get ready for her Spanish class tomorrow afternoon." My eyes about bugged out of my head. And then I slide under the table just a bit as I thought about how little we do. Swimming lessons (because everyone has to learn to swim, in my opinion) and gymnastics because the kids begged and begged and begged. At best, we have a playdate once every other week or so. The rest of the time? We hang out at home. Not doing flash cards. Or we run errands. When do these folks get their grocery shopping done? Or the dry cleaning? Or the Target runs? Seriously! I can't imagine where they fit it in. I probably shouldn't complain, because I now know why we are always the only people at the library in the afternoons, or the playground. But my mind is totally blown away by the number of activities the rest of the world engage in. And please don't get me started on the weekends, when it seems like people are running from soccer field to baseball field to swim meet. It can't be healthy, right? Children need to have downtime and know how to entertain themselves with empty boxes and scraps of yarn, right? Or am I setting my kids up for some sort life-long failure because they don't have any interest in playing soccer or baseball or any other team sport? Am I holding them back because I am too lazy to be interested in shlepping them to all those activities? Or because really, how much must all those activities cost? I like to THINK that my kids like hanging out at home with boxes and string, but maybe they would rather be running after a little black and white ball. Stranger things have happened, I suppose. I just can't imagine a scenario in which my children fail in life because I didn't take them to soccer and baseball and tennis and ballet at age three and five. I just can't. And so, we are going to continue on our current course in only enrolling in activities that are necessary (school, swimming) and those that the children beg to attend. And ask me in 20 years how my kids are doing....I'll let you know if my plan worked. This afternoon the kids and I braved the mall to return some things at Crate and Barrel and then use the credit to replace our horribly etched water and wine glasses that we got when we got married almost a decade ago. I was actually rather amazed that we still had almost all of them intact, as I can run my way through a set of dishes in less than a year. I was thrilled to go on an already paid for spending spree, and was literally rubbing my hands with glee at the thought of picking out some new glasses, even if I did have two children who have inherited the dropsies gene in tow. We got there, and I started to browse. Did you KNOW how many options are out there in the wine glass department? Big ones, small ones, colored ones, stemless ones, both C and I were astounded. "Why are there so many wine glasses here Mom?" "I have no idea, but isn't it fabulous?" At the end of the day, I walked out of the store with these and these. The exact same glasses we registered for almost a decade ago. M just laughed at me when I called to announce that he would feel right at home with our new acquisitions. Hey, at least y'all will know what to get me if you ever need a present. Just look around my house and replace whatever the item most in need of replacement is. Now that the glasses have been replaced, my guess is the bleach-stained, decade old towels. In forest green, of course. what kind of a forecast is this? "Several hours of sun." I'm so sorry but hello? Does that mean that there will be rain? You know, after the "several hours of sun?" Are the "several hours of sun" in the morning or afternoon? And what IS your definition of "several hours?" Three? Five? Seven? Rule number 453: Weather forecasting is not a field in which a variety of phrasing is appreciated. Apparently, I haven't posted in a week. Which has been pointed out to me by several folks. Yes, I'm still around, and no, nothing has happened. The weather has just been nice and I've been trying to tire the kids out by running them ragged around the neighborhood. I've also been trying to get the book fair at C's school up and running. Man, do I hate the book fair. And not just because it is Day 1 of the fair and I have already spent $50...If anyone ever asks you to volunteer to work a shift at a book fair, please, please say yes. Do it for me, OK? I'll probably be MIA for another few days, at which point my volunteer duties for the year for both school and church are (almost) over and I can focus on things like blogging and knitting again. The overview. Note the successful color changes! The very cute buttons, and slightly misshapen buttonholes. The less than perfect seam. I really need to learn to put a sweater together. Up next, probably tonight, the utterly disastrous (yet still expensive!) baby sweater that did not in fact make it into the auction as I so miserably messed up the sewing (and the arm length). Please, please tell me that someone didn't actually PAY MONEY for this research. Clearly, if they did, they didn't have children. My favorite quote from the piece? The lead sentence. "Children's bedtime problems may not only make parents lose sleep, but could also take a toll on their physical and emotional well-being, researchers reported Monday." Anywhoo, we walked to the library, C's swim lessons, the park and downtown this week. And I forgot to sunblock the kids each and every time. But as Phantom pointed out, perhaps that is just as well. (As an aside what kind of sunblock do you use on your kids? Mine hate the easy spray on/no rub stuff, which is highly unfortunate in my opinion.) We ate lunch outside under the really gross and is so totally getting replaced this weekend umbrella, and then just hosed down the deck to get rid of the yogurt and popsicle drips. We planted some flowers in the deck flower boxes, which involved three trips to Home Depot (don't ask), and got some herbs started. I got very little knitting done, although I am almost finished with M's birthday present (just ignore the fact that his birthday was over a week ago, I ran into some design issues). I did manage to stay on top of the laundry though. Which is no small feat since A insists on changing her outfit every. single. time. she uses the bathroom. M: "You're kidding me, right?" Chichimama: "No! I'm cold! Look! I'm shivering under the blanket." M checks the cool indoor/outdoor weather station I got for Christmas. M: "It is warmer in here than it has been all winter long." Chichimama: "Really? How warm is it?" Chichimama: "Huh. Well, I'm DRESSED like it is 80." M: "That might be your problem right there..."
This summer, the kids and I are instituting a "No Car Day" policy a few days a week. Because I zoomed around town today clocking exactly how far it was from our house to the library (.75 miles), to the nearest park (.90 miles), to Trader Joe's (1.5 miles), to the Y (1.6 miles) and to the diner downtown (1.6 miles). It was actually rather embarrassing that we don't walk more places. Especially since we own a rather nice double stroller. Of course it means that I have to push 65+ pounds of kids around, making for a rather strenuous workout, but exercise is good for the body, or so they tell me. We started the trend on Tuesday, walking to the library and back. The kids played red light/green light most of the way and fun was had by all. Today we walked to the Y for C's swim lesson, which was a slightly more ambitious venture. My legs are already protesting. And unlike Wednesday, no one had any interest in getting out of the stroller. But just think! I've already logged and additional 4.5 miles of walking this week without ever having to step on a treadmill. And tomorrow we are walking to the park in the afternoon for a playdate, so that's another 2 miles (well, if you round up...)! The biggest upside? I get to peer into everyone's backyards and inspect their gardens, giving me lots of ideas on how to redo our weed infested beds.